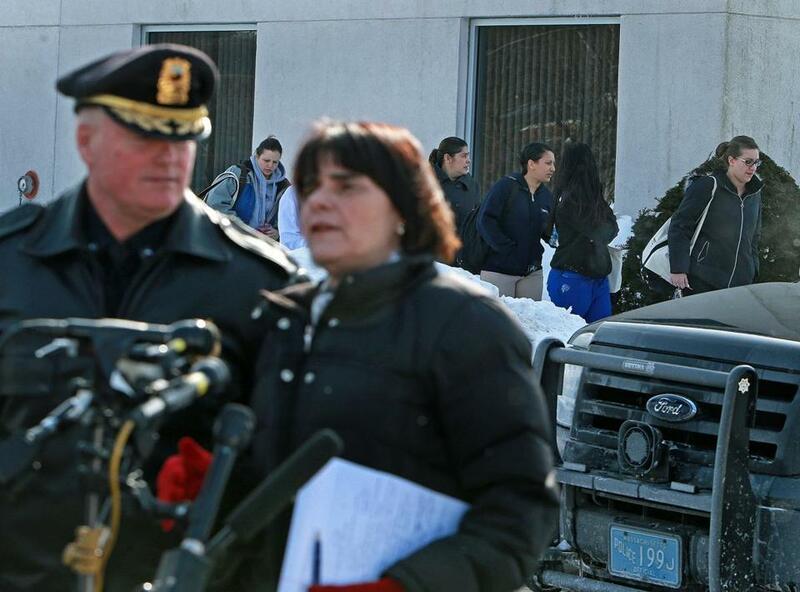 Middlesex District Attorney Marian Ryan and Tewksbury Police Chief Timothy Sheehan spoke to reporters at the Salter School, where police shot a man dead earlier in the day. TEWKSBURY — Sue Greenan looked out her bathroom window about 9 a.m. Tuesday and saw a man covered in snow pacing in the driveway next door. She figured her neighbor had finally found someone to shovel off his roof. Within moments, though, she saw what looked like a plainclothes police officer walk down Forest Avenue with a firearm aimed at the man, later identified as 30-year-old Doug Sparks. Greenan warned her grandchildren and daughter to take cover. Then, four shots rang out, she said. She did not know it then, but just a short time before she saw Sparks, he had been in a nearby parking lot at the Salter School, where, Middlesex District Attorney Marian T. Ryan said, he approached a vehicle carrying a man and woman, slashed two tires, and stabbed the people inside. By Tuesday night, further chilling details of that episode emerged. Ryan said in a statement the man and woman are school employees and were stabbed in the arms and hands. The woman was dragged by the suspect in his vehicle to another part of the parking lot as the episode continued. A preliminary investigation found that the stabbing victims and Sparks knew each other, and that the female victim had previously dated Sparks. “This frightening incident appears to be another example of a person violently confronting someone at their workplace about a personal domestic situation,” Ryan said in the statement. Officers tracked Sparks to 55 Forest Ave., with the help of a resident who was listening to a police scanner at home and provided information about where Sparks may have gone, said Tewksbury Police Chief Timothy Sheehan. Ryan said she could not say how many officers opened fire. Sparks, who lived in Medford, was pronounced dead at the Saints Campus of Lowell General Hospital, a Ryan spokeswoman said. Ryan did not release the names of the stabbing victims. Before the stabbing, the man identified as Sparks had been observed “fairly early” Tuesday morning in the parking lot on Woburn Street, Ryan said. After he confronted the man and woman as they arrived for work, an altercation ensued which led to the stabbing, Ryan said. The injured man and woman were taken to Lowell General Hospital to be treated for their stab wounds, which were not considered life-threatening, officials said. A narcotics detective and a detective have been placed on administrative duty while the shooting is investigated, said Sheehan. He did not release the detectives’ names. Two portions of the Salter School parking lot were cordoned off with yellow tape, including an area in which a white Chevrolet with a broken driver’s side rear window was parked. Students inside the school were ordered to stay put while investigators conducted interviews, Sheehan said. They were dismissed about 2 p.m. In a statement issued Tuesday night, Salter administrators said the school employees who were injured work in admissions. The school said counseling would be offered to everyone on campus. Greenan said before hearing gunfire, she saw the man later identified as Sparks raise his right arm. She said she could not see his left hand. Officers found footprints in her backyard, including ones that led to her cellar door, Greenan said. Richard Landers, 74, a retired police officer who also lives in the neighborhood, said he walked to the scene after hearing gunfire. He said officers were giving CPR to a man lying on his back with blood near his head and neck. Greenan expressed sympathy for the deceased man and police. Martin Finucane of the Globe staff and Globe correspondent Rebecca Fiore contributed to this report. Laura Crimaldi can be reached at laura.crimaldi@globe.com.